You have a compression package out in the field that’s done its job for years: efficiently, reliably and at a reasonable operating cost. All things considered, you couldn’t ask for more. With time, though, things change. The package gradually loses efficiency, your marketing strategy changes, or the package doesn’t suit the wet gas plays that have become the norm in western North America. You decide to remove it from service and buy something new. Allan Anderson’s advice: assess your options first. As Anderson sees it, gas producers who buy new without first assessing their options could be missing an opportunity. 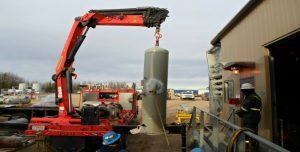 The Compass retrofit team has deep experience with a vast range of compression and process equipment – from 1970s technology up to the newest equipment. Recently, as part of a normal day, the Compass Calgary retrofit shop was preparing a sweet-to-sour conversion quote on a series of compression packages, and several restaging projects were nearing completion. Engine swaps and emissions control modifications are also often in the mix. For Anderson and his team, the variety and technical challenge of retrofit is a big part of the attraction.